Solo Pub Entertainer – First Gig. I have been blessed with rather a loud voice and at times of stress there’s an unmistakeable Irish, but sometimes Scottish, accent colouring it. It can sound quite intimidating. The silence following this outburst was almost absolute and now, as I very quickly realised, I was faced with several hard drinking, pretty rugged, fit looking, working men all curious to know who was shouting and making such a noise in their regular drinking hole! Gazing at this by now mean looking and truculent crowd with my heart now in my mouth I realised I might have to change tack a bit if I wanted to get home in one piece so I modified my belligerent tone and continued in a more plaintive reasoning voice. Looks were exchanged, heads were nodded; they were decent folk after all, and a silent agreement was reached between us all. To a man they all shut up, well nearly all, some still hadn’t noticed what was going on but they’d been there when I arrived and looked as though they’d been there for all of their adult lives. The rest faced me expectantly so, now challenged, I strapped my trusty guitar back on and sang my arrangement of Gordon Lightfoot’s song: ‘In The Early Morning Rain’. I gave it all I had, running the riffs up and down where they interacted with the lyric of the song, flat-picking the chords with fine style, and I ‘sang the story’ to them. And they listened. They didn’t make a sound. When I finished there was a heart stopping silence before a single pair of hands began to clap and then some others joined in and then some more and some of them were calling over to me that I was ‘quite good’. I’d like to write that the whole pub was up and standing on their feet cheering and whistling, swamping the room with their loud applause but that would be a fiction, that didn’t happen. There was a fair amount of what I believed was genuine applause and, smiling at them, accepting their genuine plaudits, I thanked those who were applauding, thinking I’d won through when a solitary voice, clear as a bell and easily carried above the now diminishing noise spoke out. ‘Right,’ it said, ‘we’ve given you a go, now you can f*ck off home!’ My heart fell into my boots as I heard this but then that bald unwelcome and negative statement was immediately followed by the room erupting with loud and sustained merriment as the wag was back slapped and congratulated on his scintillating wit. I couldn’t help myself, I laughed along with them and I think it was this that finally won them over to me. Well that and the landlord shouting above the laughter. Everything improved from that point on, I got back on with my show, they did listen and some applauded after every song and I found the courage to tell a joke or two in between songs. When I’d finished and was having a pint with the landlord and the remaining punters we ended up chatting and laughing away like old pals. I got paid the agreed fee, probably around a tenner back then, and the landlord told me he’d have me back but only if I brought a P.A. system next time. As first gigs go it was a real eye opener into the difference between folk clubs, where audiences arrived with expectations, wanting to hear you sing your songs, and pubs where you were just an added attraction, a commodity, designed to please the drinkers and keep them in your pub a bit longer than they might have planned to stay. Happily, as my reputation grew and I learned how to work in pubs, the gigs got a lot easier and more well paid too. 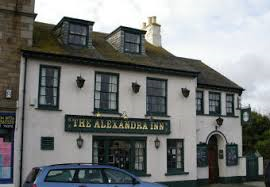 Incidentally, I’ve just been reminded by Martin Val Baker the famed South West Music Promoter who did so much for the arts in Penzance and St Ives, to mention just two towns, that The Winter Gardens, scene of many a Folk Concert staged by Martin, was just around the corner from the Alexandra Inn. I would become quite familiar with the Winter Gardens some years later when Martin began to use me and some others as support acts for some fairly well known ‘names’ in the Folk Scene who performed in concerts there.